The Solita Soho Hotel, an Ascend Hotel Collection Member features a fitness centre, tour or ticket assistance and multilingual staff. Wired and wireless Internet access is complimentary. This business-friendly hotel also offers coffee/tea in common area, laundry facilities and dry cleaning/laundry services. The Solita Soho Hotel, an Ascend Hotel Collection Member is a smoke-free property. 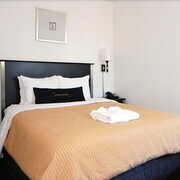 Located in Little Italy, this hotel is within 2 miles (3 km) of New York University, 5th Avenue and Washington Square Park. National September 11 Memorial and Brooklyn Bridge are also within 1 mile (2 km). Canal St. Station (Lafayette St.) and Spring St. Station are within a 5-minute walk. Along with a fitness centre, this smoke-free hotel has coffee/tea in a common area and dry cleaning. WiFi in public areas is free. Other amenities include laundry facilities, a 24-hour front desk and tour/ticket assistance. All 42 rooms boast deep soaking bathtubs, and offer free WiFi and LCD TVs. Other amenities available to guests include free wired Internet, room service (during limited hours) and premium bedding. The Solita Soho Hotel, an Ascend Hotel Collection Member offers 42 forms of air-conditioned accommodation with a safe and free newspapers. Beds feature premium bedding. LCD televisions come with cable channels. Bathrooms include a combined bath/shower unit with a deep soaking bath, complimentary toiletries and a hairdryer. Guests can surf the web using complimentary wired and wireless Internet access. Business-friendly amenities include desks along with free local calls (restrictions may apply). Additionally, rooms include coffee/tea makers and an iron/ironing board. Housekeeping is provided on a daily basis.